-this is a club of monsters,"rawr" i mean a club for monsters lovers and acting like a monsters obviously..
i think this is right place you can join if you are monsters/ cute monster! -	monster! 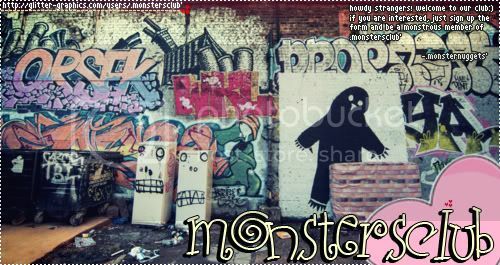 `we are acting like a monster/cute monsters but that does not mean that fighting is acceptable in this club. fighting is restricted in this club.if you have problems to your clubmates or me them pls. inform us about that. `every animals/human being and also the real you are have different face and attitudes,so COPYING/stealing some documents of your clubmates are strictly not allowed in this club.if you not obey this then bounce off! this is not the right place for you! ok?. `always smile while working :) it will helps you to do a job nice,neat and good looking graphics. this will help a graphics designer/clickie maker to do their best in making graphics! what`s this? = this is your monstrous name in this club (ex. `monstrousfreak,deadlymonster, ect.) this will classified as fiction monsters. the cathegories are fiction monsters and non-fiction monsters.exampls of non-fiction monsters:elmo,barney,cockie monster,sulley,mike ect. (usually the characters of disney pixar and cartoon network).and for fiction monsters just invent your own name.when the name is already taken, you cannot clone/take it again.unless you have permission to the owner of that name but its best to have your own name in this club. Login or register to add .Ð¼ÏƒÐ¸Æ¨Ñ‚É›ÑÆ¨clÊ‹Ð²` as your friend! If you save your icons in PNG files after editing them their quality may turn out better. how's the club? is it still active? going on holiday tomorrow and since this message i've sent i wont be online until next friday(: adiosss! how's the club? do you have a banner already? THANK YOU!! :D So, is there anything i can help or do?